From the beginning of 2015 to the present, the price of crude oil is like a roller coaster, falling sharply and then rising again and then falling. It is testing everyone’s heart durability. Recently, oil prices seem to be a bit more stable than before. West Texas Intermediate oil prices fluctuate between $45 and $50. Well, this seems to be better than the price dropped below $30 earlier this year. But it is still far below the price that oil companies can make. Everyone is struggling, no one is willing to give up, if we can’t make money, we need to do our best to find out how to save money. As a leader in the solids control business, GN Solids Control can help you save money and survive difficult times. Since GN’s establishment from 2007, its solid control equipment and mud recycling system have been sold to more than 60 countries. GN’s mud recycling system can be applied in many areas, such as oil and gas drilling, diamond drilling, HDD, tunnel boring, piling, dredging, etc. 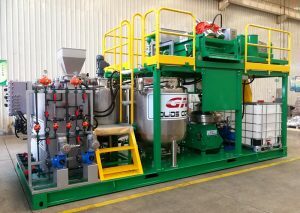 Please allow me to introduce to you our Oil sludge treatment system. GN’s long view for the future market has lead us into a new ago of products development. After many years of research and development, in the year of 2016 we brought our Oil Sludge treatment system to the world. It contains our vacuum pump, mixing tanks with 3 stages separation equipment, and oil and water recovery tanks. It can be used for waste oil sludge/sand in raw oil tank bottom, from refinery plant, and from a drilling rig. In currently market there are few company can offer the entire system to client with customization services, and their unit cost a fortune to purchase. It is very important that to recycle oil as much as possible with a low cost. We have made good business cooperation with world renowned service company like Baker Hughes. Together we service the largest oil company in Kuwait—KOC Kuwait Oil Company. 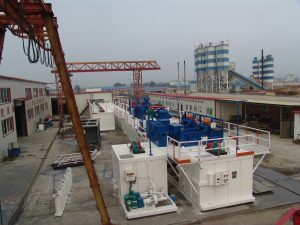 But we didn’t stop there, with different client’s different job requirements, GN offers different models of oil sludges treating system as well as Thermal Desorption Unit. After treatment, client company will be able to recover oil and water for re-sale and re-use porpoises. Creating extra value for used to be wastes—oil sludge. In this very competitive market, we offer many different systems to satisfy different industries, different clients. We will keep researching new frontier, new equipment to keep GN’s leading position. That is the basic introduction about the mud recycling system, If you have some further interest, welcome to visit www.gnsolidsamerica.com and please send your inquiries to USA@gnsolidscontrol.com . Dewatering System GNXT7015 is custom made system base on user’s operation need and design toward the need. It is the stand alone Dewatering System. 。Dewatering System’s treating capacity can reach to 120m3/h. Discharge volume minimum 100 m3/h. The System mainly operate by shale shaker system GNXT7015-01, Main Material Collect Hopper GNXT7015-02 and Mining Shaker Tank System GNXT7015-03， GNXT7015-02中The system working site collect treat-need material with Main Material Collect Hopper GNXT7015-02， GNXT7015-03’s mining shaker ZKR-1230 within collected material and added water for dilution, it flow to mining shaker system GNXT7015-03’s mining shaker ZKR-1230， Materials pass through separation of shale shaker, the solids exit the tank and liquid pass through shale shaker screen and flow into the tank. The Submersible Slurry Pump GN100YZ100A-30 that is on Mining shaker tank system GNXT7015-03’s pipe feed the liquid to shale shaker tank system GNXT7015-01’s shale shaker GNZS5594E-LDF， The Solids filter though shale shaker and exit outside of the tank, the liquid filter through shale shaker screen enter the sinking sand compartment, then shale shaker tank system GNXT7015-01’s Submersible Slurry Pump GN100YZ100A-30 feed into GNZJ594E-D8N Disilter， Liquid after treatment flow to Shale Shaker Tank System GNXT7015-01’s mud removal tank, the liquid pass through pump and exit the system. The solids exit from disilter and pass through disilter shaker and solids exit the This system also equip with biding system that allow operator depends on site operation situation for chemical-add purpose. GN Solids America LLC as manufacture of these machineries offer transparent pricing policy and offer full after service capacity as just like other US manufactures. For other solids control machinery, GN Solids America LLC offer various model of shale shaker with multiple layers of screens panel. This combo unit is functioning as both primary shale shaker and desander unit in one. Now China is like old UK, we got many problems with coal usage, we knew it, trust me, we knew it, and still, we are on the old track, having the same problem, maybe not a tragedy yet, but close. For environment problems, we need to handle much more than coal, different pollution comes to us before we realized it was our price for developing. And we never realized that when we did it, at least we never thought it was a problem. Lucky now we know, now we wake up, in the smoke, we are trying to repair, find solution for the damaged planet. The biggest job we can handle is not so related to air pollution, or water pollution, it is part of them, and fortunatly we are part of it. This time a client comes to us, need to separate the waste, even for this project, waste from different place. With differnt size particles. When we analyse the site waste, from pictures, samples, we decided to use a system, which contains a shale shaker, and a decanter centrifuge. Shale shaker for dispose most of the big ones, then centrifuges with foluccent maybe, maybe not, to separate the small ones, to reuse water at the same time. For thic specific project, we are using GNZS594E shale shaker, with G force upto 7, and armed with composite material screens to increase the equipment life time. For the centrifuge, we are using most popular model GNLW363CG-VFD, SS2205, tungstun carbide tiles screw etc. This same logic is widely open sourced, can be extend to different similar ideas, different shaker, different centriruge, also work. Oil sludge is the by-product when producing oil, mixed with water, oil, and solid sediment, which is the dangerous waste but has high recycling value. With the increasingly tense supply of oil resources, many countries are doing researches in oil sludge recycling technology. 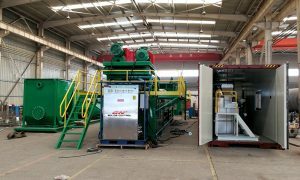 The pyrolysis technology is drawing wide attention of researchers all over the world with its advantages of disposal thoroughly and high energy recycling. The proper oil sludge treatment is essential since these waste materials are hazardous to human and environment. In oilfield operations oily sludges are produced as sediments in tanks and apparatus, as well as from oil spills (e.g. in the course of maintenance / repair work, or due to pipeline leaks). Those sludges, in their original form, can have extremely high solids contents at moderate to high oil contents. However, at the time when the sludges from different sources are combined and prepared for treatment, the oil / water / solids ratios are such, that treatment with normal oil sludge processing equipment is easily possible. Very often oilfield sludges are collected in lagoons and withdrawn from there for processing, rather than being processed directly downstream of the source / collection point. The differing origins and compositions of waste oil mean that its water, oil and solids content can vary considerably. A water content in the order of 40-80% by volume, approximately 10-50% by volume oil phase with rather high viscosity, and a high solids content (in the order of 10-40% by volume) with potentially very large particle sizes, as well as potential content of significant amounts of other debris often characterize this product. 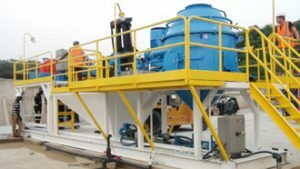 Compared to many other waste oil applications, the product properties oil field sludges require special attention be given to the mechanical pre-treatment of the sludges prior to processing. And because the recovered oil is usually not refined on-site, but rather added to the crude oil stream before it is sent to refining, the oil quality is normally sufficient using 3-phase decanter technology, which means these systems can typically be designed with one single 3-phase separation step.